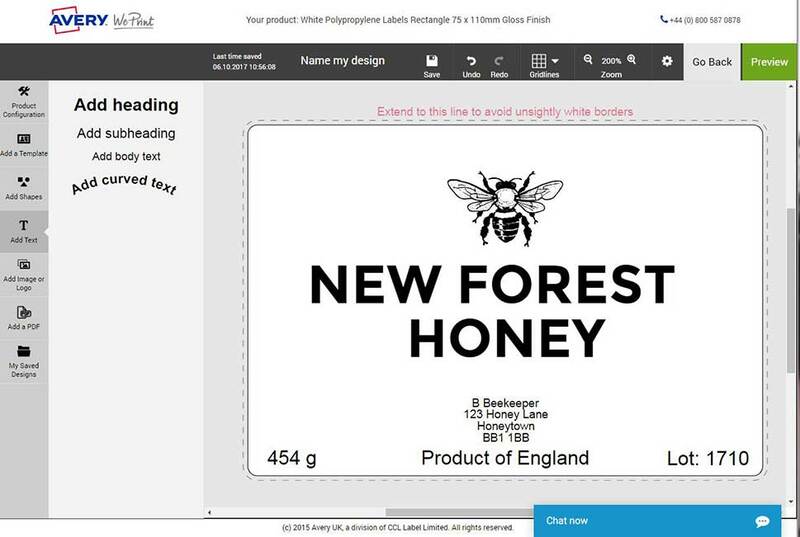 It’s easy to make professional looking labels for your honey with Avery WePrint. There’s such a wide range of shapes, sizes and materials that you’ll be able to find a good fit for your honey jars. And you can be confident that your labels will look better for longer because we prioritise high quality materials, printing and adhesive. Choose from matt or gloss paper, white or clear plastic (polypropylene) or textured ‘Antique White’ labels. Use the online Design Tool to create your own design, adjust a ready-made template or upload your own finished artwork for your honey labels. But before you get started, do make sure you know the regulations if you’re selling honey to the public. Here’s a guide to the main requirements for labelling honey for sale. We recommend you check with your local Trading Standards officer if you are unsure, but hope you find this handy guide useful. If you’re a small producer, you don’t need to be registered or certified with your local environmental health office. But you should follow good practice as much as possible, by making sure your processing is conducted in hygienic conditions, and that your records are up to date. Environmental health officers have been known to visit producers of honey! Under these regulations, the name of the food and the net quantity must appear in the same ‘field of vision’. That means on the same label or on the same side of the jar. It can be difficult to assign a date to honey since it can last for many years, if stored correctly! With honey, the year needs to be included because it lasts for more than three months. You have to use your judgement and most beekeeper associations recommend two to five years. ‘Best before’ and a full date or ‘Best before end’ with a month and year is also acceptable. ‘Use by’ should not be used with honey because it suggests that the honey will be unsafe after that date. The Honey Regulations 2015 are based on an EU Honey Directive and state what can be sold as honey. There are specific terms for different types of honey: baker’s, blossom, chunk, comb, cut comb in honey, drained, extracted, filtered, honeydew, nectar and pressed. The requirements for the make-up of the honey are quite technical, and you probably won’t have the equipment at home to measure the fructose, sucrose, water and other contents in honey! But there’s no need to worry because the honey extracted from a hive is highly likely to be well within the requirements. You can add the ‘regional, territorial or topographical’ origin, provided all of the honey is mainly from that place. It could be a village, town, borough, county, country estate or farm. A less defined area, such as ‘Poldark country’ might be questioned. If the honey is wholly or mainly from a particular type of plant and contains characteristics of the source such as ‘heather honey’, you can label it as such. It’s generally accepted that named sources should constitute more than 75% of the honey. The Honey Regulations also require the country to be included. For example ‘Product of England’. Honey can be sold in any weight, but the weight must be a metric weight. It can be written as ‘454 g’ (with or without a space before the g) or ‘454 grams’ but not ‘gr’ or ‘gm’. Kilograms can be also used, and the equivalent imperial measures are also allowed, but must follow the metric weight. If you are selling honey, you should be using commercial rather than domestic scales to determine the weight and there are specific rules about determining weight when each jar is not weighed. 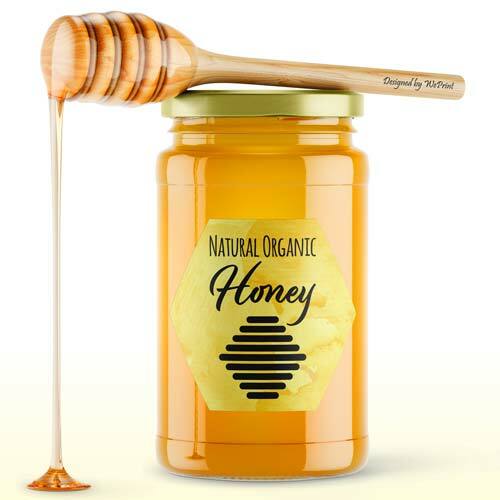 There are minimum sizes for the lettering stating the weight on honey labels: 4mm for contents weighing 200g to 1kg; 3mm for 50g to 200g; and 2mm for contents of 50g or less. As a guide the font size of 12 is 4mm high on our software, but this may vary on other software packages so it’s always best to check. We also recommend that you use the Arial font for the weights marking as it is clear and easy to read. You can use images of plants, flowers, bees, honeycomb and bee hives on the label, even if the hive pictured is not the type used. Just make sure you have the rights to use any images and the image is not misleading to consumers. If you are making honey in batches, they need to be traceable through the packaging and sales process. This is covered by The Food (Lot Marking) Regulations 1996. Best practice is to make lots as small as possible to minimise any recall. Lot information can be added by hand to pre-printed labels. Choose your sticky labels and start creating with our design tool, or upload your own design. Your local trading standards officer is always the best place to start if you’re not sure about any of the honey labelling requirements.